This volume provides an introduction to the philosophies of the special sciences, aimed at graduate students in both philosophy of science and in the various sciences, as well as researchers in the various sciences interested in the philosophy of their particular field of work. 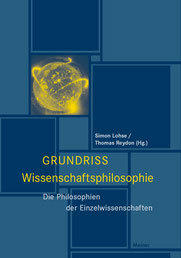 The term 'science' is conceived broadly, in the sense of the German term 'Wissenschaft', and the volume covers a wide spectrum of academic disciplines: included are chapters on the philosophy of physics, chemistry, biology, biomedical science, neuroscience, cognitive science, psychology, geosciences and environmental science, climate science, the engineering sciences, sociology, economics, legal studies, political science, mathematics, linguistics, literary studies, historical science, as well as a chapter on the philosophy of philosophy. Download the table of contents here (pdf). Clicking on the cover picture gets you to the publisher's page for the book (Felix Meiner Verlag). 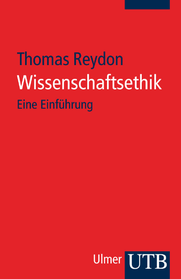 The publisher's page for the edition with Wissenschaftliche Buchgesellschaft is here). Contributing authors: Richard Bradley, Chris Buskes, Uljana Feest, Eugen Fischer, Roman Frigg, Jens Greve, Sven Ove Hansson, Catherine Herfeld, Wolfram Hinzen, Lara Huber, Dietmar Hübner, Lara Keuck, Tobias Klauk, Maarten Kleinhans, Tilmann Köppe, Meinard Kuhlmann, Simon Lohse, Holger Lyre, Henk de Regt, Julian Reiss, Thomas Reydon, Joachim Schummer, Katie Steele, Erica Thompson, Sven Walter, Charlotte Werndl, Torsten Wilholt, Christian Wüthrich, Benno Zabel. This book is concerned with two intimately related topics of metaphysics: the identity of entities and the foundations of classification. What it adds to previous discussions of these topics is that it addresses them with respect to human-made entities, that is, artefacts. As the chapters in the book show, questions of identity and classification require other treatments and lead to other answers for artefacts than for natural entities. These answers are of interest to philosophers not only for their clarification of artefacts as a category of things but also for the new light they may shed on these issues with respect to natural entities. Download the table of contents here (pdf). Clicking on the cover picture gets you to the publisher's page for the book. Contributing authors: Massimiliano Carrara, Crawford Elder, Maarten Franssen, Silvia Gaio, Nicola Guarino, Wybo Houkes, Eric Kerr, Peter Kroes, Diego Lawler, E.J. Lowe, Beth Preston, Thomas Reydon, Marzia Soavi, Amie Thomasson, Jesús Vega-Encabo, Pieter Vermaas. Researchers in the natural sciences (but in other areas of academic research and teaching too) are confronted with ethical issues, questions and problems on a regular basis. This introductory text in research ethics is aimed primarily at students in the natural sciences and is intended to make them aware of the various kinds of ethical issues that may arise in their later professional practice, as well as the responsability the working scientists have toward their colleagues, the scientific community in general, and society. Clicking on the cover picture gets you to the publisher's page for the book. The publisher's flyer is here (pdf). The Google Books page is here. 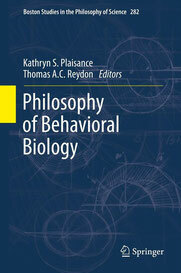 This volume provides a broad overview of issues in the philosophy of behavioral biology, covering four main themes: genetic, developmental, evolutionary, and neurobiological explanations of behavior. It is both interdisciplinary and empirically informed in its approach, addressing philosophical issues that arise from recent scientific findings in biological research on human and non-human animal behavior. Accordingly, it includes papers by professional philosophers and philosophers of science, as well as practicing scientists. Much of the work in this volume builds on presentations given at the international conference, “Biological Explanations of Behavior: Philosophical Perspectives”, held in 2008 at the Leibniz Universität Hannover in Germany. The volume is intended to be of interest to a broad range of audiences, which includes philosophers (e.g., philosophers of mind, philosophers of biology, and metaethicists), as well as practicing scientists, such as biologists or psychologists whose interests relate to biological explanations of behavior. Download the table of contents here (pdf). Clicking on the cover picture gets you to the publisher's page for the book, the Google Books page is here. Contributing authors: Adele Abrahamsen, Colin Allen, William Bechtel, Christine Clavien, Helen de Cruz, Andrew Fenton, Brian Garvey, Rebekka Klein, Helen Longino, Mark Nelissen, Robert Northcott, Kathryn Plaisance, Thomas Reydon, Armin Schulz, Johan de Smedt, Karola Stotz, Eric Turkheimer, Jan Verpooten, Chuck Ward, Marcel Weber, David Sloan Wilson. When representatives of various disciplines are asked about the relevance of Gottfried Wilhelm Leibniz for their field, the answer often is that in their particular field, too, Leibniz made an important contribution. Leibniz, who lived and worked in Hannover for forty years, still impresses us today not only because of the excellence of his contributions, but also because of the great scope of his work. This book collects essays on Leibniz' work in the fields of history, theology, philosophy, mathematics, engineering, linguistics, law, political consultancy, and insurance, as well as a biographical essay on Leibniz' time in Hannover. 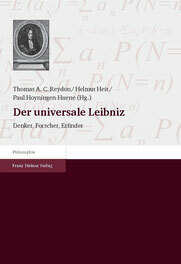 The essays aim to give an overview of the scope of Leibniz' work and are based on a series of lectures given in Hannover in the Summer Semester of 2007 on the occasion of the official renaming of the University of Hannover to Leibniz Universität Hannover. Download the table of contents here (pdf). Clicking on the cover picture gets you to the publisher's page for the book. Contributing authors: Herbert Breger, Hubertus Busche, Werner Eisner, Carl-Hans Hauptmeyer, Eike Christian Hirsch, Eberhard Knobloch, Peter Schlobinski, Wilhelm Schmidt-Biggemann, Hans-Peter Schneider, Erwin Stein, Rolf Wernstedt. This book originated as a Festschrift to mark the publication of Volume 50 of the journal Acta Biotheoretica in 2002 and the journal's 70th anniversary in 2005. In it, eleven previously unpublished research papers have been collected that reflect the entire scope of topics on which Acta Biotheoretica publishes. 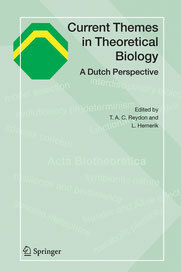 Acta Biotheoretica is a journal on theoretical biology that has its roots in the Dutch tradition of theoretical biology. From the perspective of this tradition, theoretical biology is understood as encompassing a broad spectrum of disciplines ranging from mathematical biology to philosophy of biology. To reflect the Dutch roots of the journal, all papers have been invited from authors that work in The Netherlands. This book is aimed at an audience of theoretical and mathematical biologists, philosophers of biology and philosophers of science, and biologists in general. Download the table of contents here (pdf). Clicking on the cover picture gets you to the publisher's page for the book, the Google Books page is here. Contributing authors: Piet Dullemeijer, Martijn Egas, Rampal Etienne, Johan Grasman, Thomas Hagenaars, Lia Hemerik, Rob Hengeveld, Onno van Herwaarden, Nelly van der Hoeven, Patrick Jansen, S.A.L.M. Kooijman, D.J. 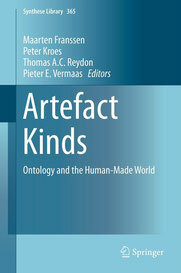 Kornet, James McAllister, Thomas Reydon, Wim van der Steen, Cor van der Weele, Arno Wouters.